Will you dare cross the threshold of the haunted Mysterium Manor? 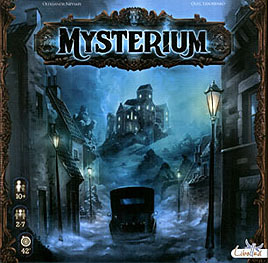 In this asymmetric cooperative game, one player adopts the role of the ghost and the others play as psychics. All players share the same goal of shedding light on the strange circumstances surrounding the ghost's death and laying his spirit to rest at last. Unable to speak, the ghost attempts to communicate by sending visions to the gathered psychics, who will be able to reconstruct the events of the fateful evening by correctly interpreting these ethereal messages. Cooperation and inspired guesswork will facilitate their task of unmasking the culprit. Step inside, be seated and let your intuition guide you!